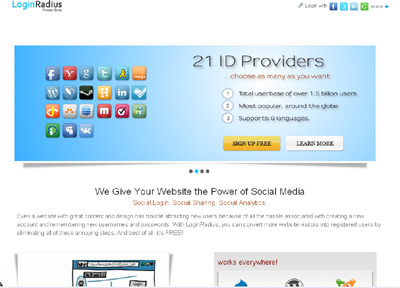 LoginRadius is a Software As A Service (SAAS) which enables social login through providers such as Facebook, Twitter, Google, and 15 others, on a third party website. LoginRadius was built on two key principals that underlies all of our work: first, to eliminate the registration process from the point of view of an end-user, allowing users to log in without creating another username and password, and second, to allow website owners to add OpenIDs/oAuths on their websites without knowledge of advanced programming and without the need to research APIs for individual ID providers. LoginRadius successfully meets these goals and also functions independently of technological platform, i.e. it works everywhere! 1. FREE service: LoginRadius is a free service and will remain free! Our mission is to support the OpenID movement and make it accessible and affordable to everyone. 2. It works everywhere: We developed LoginRadius to function independently of technological platform! It works everywhere. Currently, we have SDKs for PHP, .NET, Java, and Python, as well as add-ons for WordPress, Joomla, Drupal, and osCommerce. Clients can also develop their own SDKs and add-ons. 3. 24/7 Tech Support: We believe a product is incomplete if it isn’t accompanied by 24/7 tech support, especially if the product supports login functionality crucial to every website. Thus, we provide round the clock support, which is free as well. 4. Social Media Solutions under one umbrella: LoginRadius has brought 4 major solutions, namely Social Login, Social Sharing, Social Counter, and Social Analytics, under one umbrella!